Description: This animal may grow to up to 11mm in length. Unlike the species in the genus Onchidoris, D. luteocincta has a conspicuous coloration. The mantle is white with a central red blotch. The mantle tubercles are white and conical in shape. There is a yellow band around the mantle edge. Habitat: Feeds on the bryozoan Nolella spp. and is often found on silt covered rocks. Distribution: Found all around the British Isles and reported from Norway to the Mediterranean. 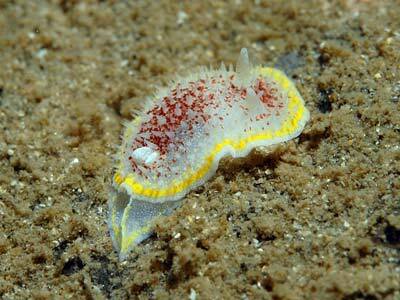 Several other species occur in the Mediterranean and the true D. luteocincta may not occur there. Diaphorodoris alba formerly known as variety alba, which occurs in the Mediterranean and north to the south coast of Britain, is a distinct species. It usually lacks the red pigment in the centre of the back and has a thicker yellow marginal line which extends underneath the edge of the mantle. 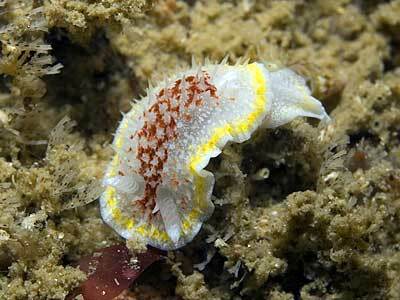 Similar Species: The colour of this nudibranch distinguishes it from any other in the British Isles. White mantle with yellow rim. Red patch in the centre of the back. Picton, B.E. & Morrow, C.C. (2016). Diaphorodoris luteocincta (M Sars, 1870). [In] Encyclopedia of Marine Life of Britain and Ireland.